Topic : "Epilogue to Wall-e"
This was my entry for the Blue Canvas "New Beginnings" competition. 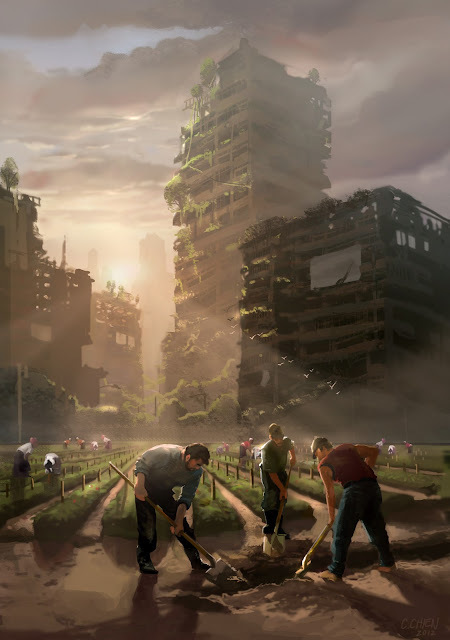 In a post-apocalyptic era, pollution and global warming have torn the earth to pieces. Mankind rebuilds civilization as an agricultural community. He humbles himself to the destructive power of mother nature and cherishes the earth as his ancestors once did. A new beginning but an old tradition. Not really the epilogue to wall-e.. but it's basically the same idea. Awesome, I really like the mood in the piece. Ilike it! It glows! Reminds me of the style of Daniel Lieske! thanks guys - well i'm certainly not as good as that daniel lieske guy - but i appreciate the compliment.